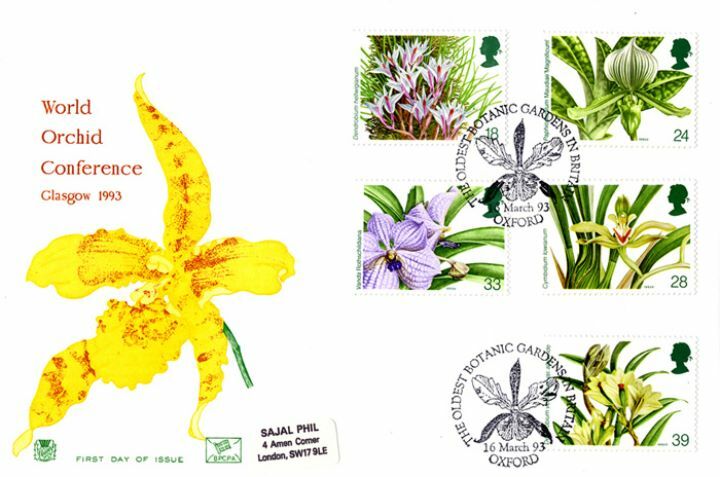 The above Royal Mail Orchid Conference stamps were issued on 16 March 1993 by Royal Mail and feature the following stamp designs: 18p Dendrobium hellwigianum; 24p Paphiopedilum Maudiae "Magnificum"; 28p Cymbidium Iowianum; 33p Vanda Rothschildiana; 39p Dendrobium vexillarius var. albiviride. The World Orchid Conference first day cover with the Oxford, Botanic Gardens, Special Handstamp postmark has been produced by Stuart and features these stamps which can make a very collectible and lovely gift.